(Logan, UT— May 29, 2018) — Altra’s 33mm max-cushioned trail shoe, the Olympus, got a complete makeover just in time for National Trails Day on Saturday, June 2. With a sleek, new design making the shoe lighter, lower and more stable, this is Altra’s best Olympus to date. The Olympus’ popular Vibram® MegaGrip™ outsole was broadened across the heel by 8 mm. 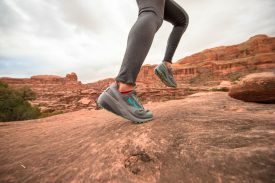 This extra surface area allows for increased stability and traction on the gnarliest trails—including slick rock and uneven terrain—especially for thru hikes and ultra-marathons. The midsole has lighter EVA cushioning and InnerFlex™ for improved flexibility and responsiveness. The upper now has an integrated tongue for a seamless fit, along with a more breathable and durable mesh. Altra’s new 4-Point GaiterTrap™ was also added for the snuggest fitting gaiters with maximum protection against trail debris. The Olympus is the lightest true max-cushion shoe on the market, with a 33 mm stack height and a low weight of 10.7 ounces for men and 8.2 ounces for women. Color options for men are black/yellow, gray/red and green, while color options for women are black/white, gray/teal and raspberry. The Olympus 3.0 retails for $150 and is available on www.AltraRunning.com and at your local specialty running store retailer. Media Contact: Colleen Logan, VP Marketing, clogan@iconfitness.com.